It’s the first time in 12 years that the two Koreas will be marching as one at an Olympics event. At PyeongChang, the South and North have also taken their relations up a notch by forming their first ever unified Olympics team in women’s ice hockey. While the joint march is viewed as a significant diplomatic breakthrough achieved between the two Koreas, South Korean citizens here remain divided on whether the gesture is the right move at a time when inter-Korea tensions are at their highest. According to a poll of 500 South Korean adults conducted by local polling agency Realmeter on behalf of South Korean TV and radio station TBS, around 40.5 percent support the decision to have South Korean and North Korean athletes march together under the Korean Unification Flag at the Olympics opening event. Some 68.5 percent of conservatives and 54.8 percent of centrists said that the South and North should each march under their own flags. Meanwhile, 56.1 percent of those identifying themselves as “liberal” answered that marching together under the Korean United Flag is the right option. To get a better sense of how South Korean citizens really felt about the highly-anticipated joint flag march at the first ever Winter Olympics being hosted by South Korea, The Korea Herald asked various people of different ages and backgrounds about their thoughts on the issue. Kim Jae-hyun, a 34-year-old male office worker working in Seoul, stressed that South Korea and North Korea are completely different countries, and that a joint flag march holds little meaning at this point. “Right now, I see South Korea and North Korea as two entirely separate countries, with more differences than commonalities. I don’t see much good coming from presenting a unified flag at an international event like the Olympics, which South Korea has been prepping for alone with little to no contribution from North Korea,” Kim said. Lee Min-wook, a 28-year-old male working for the PyeongChang Olympics, echoed the view that the two Koreas are separate entities, and that South Korea is going out of its way to be inclusive of its Northern neighbor. “They are two entirely different countries with independent governments and a physical border that cannot be freely crossed,” said Lee. “I don’t see why South Korea and North Korea have to march under a unified flag, never mind form a joint team in women’s hockey. It’s not like an official unified flag has always existed, or the athletes have been preparing for the Olympics together from the start,” he said. South Korea and North Korea have remained split since 1945, when the US and the then-Soviet Union signed an agreement to divide the peninsula at the 38th parallel, with the former occupying the South and the latter occupying the North. Five years later, the Korean War broke out when the Soviet-backed North invaded the South. The war ended in an armistice signed in 1953, with the establishment of a Demilitarized Zone, or DMZ, at the border. Since then, the two Koreas have gone on starkly different paths, in terms of their political systems and economies. Talks of a reunification have persisted for the past 65 years, without success. Other citizens cited concerns that the Olympics are becoming all about North Korea, shifting focus from the actual games and everything that South Korea has been doing as the event’s host country. “I feel like North Korea is freeriding on an international event that South Korea has been preparing for and stealing the spotlight,” said Shin Sung-ah, a 40-year-old female office worker in Seoul. “The unified flag march is just yet another example of North Korea taking advantage of the opportunity to improve its image before an international audience without making any meaningful commitments,” she added. At the same time, some South Koreans felt optimistic toward South Korea’s decision to march under a unified flag with North Korea, as it aligns with the Olympic spirit of peace, cooperation and unity. Park Young-joon, a male office worker in his early 30s, said that the Korean Unification Flag can act as a positive event in diffusing already-high tensions between the two Koreas, as well as imbue a more profound meaning to the PyeongChang Olympics. “I think the unified flag and the joint entrance can send a positive signal to the world especially at time of heightened tensions over North Korea’s nuclear and missile programs,” Park said. Lee Sa-ran, a 35-year-old female worker in Seoul, said that a joint entrance by the two Koreas is a meaningful achievement by South Korea which is hosting a peace-promoting event like the Olympics. 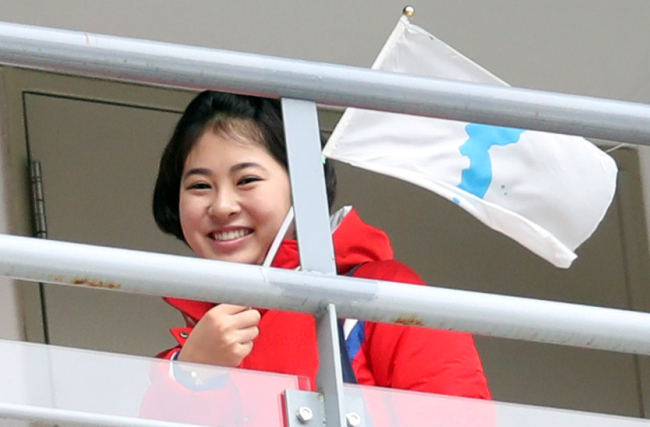 Yoo Kyung-min, a 32-year-old female worker at a Korean pharmaceutical company, said that the unified flag could be a positive gesture toward peace and reunification of the Korean Peninsula, but that its presentation at the Olympics is questionable. Jeong Jae-heon, a 26-year-old male student in Seoul, noted that South Korea’s decision to march under a unified flag at the Olympics has led to more division and hatred among South Koreans. Song Hye-sun, a 55-year-old housewife in Seoul, said that marching under a unified flag may seem like a good idea superficially, but that it won’t do much good to South Korea in the long run. “Though the unified flag seems like a nice gesture toward unification, it’s not the wisest decision considering North Korea’s actions in the past,” Song said. However, she cited hopes that maybe this time, things will be different, and marching under the unified flag can help bring the two Koreas closer to talks toward a peaceful reunification. “Since the joint march is happening anyway, I hope that it can really pave the way to meaningful reunification talks between the North and South and draw us closer toward a united future.